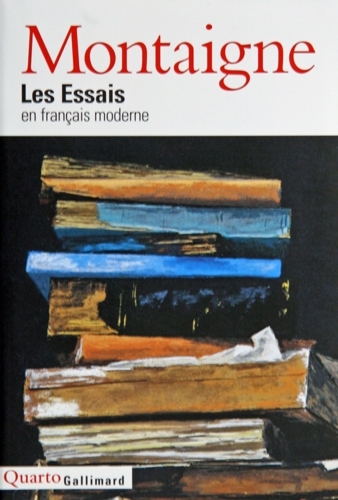 Although I am a Frenchman, born and raised in Paris, and I don't appreciate the English language that much, I have been blogging in English for more that four years. There were many reasons for it, that I explained several times. Yet, the reasons have progressively vanished. I don't feel like writing in English any more. If I keep on blogging, which is likely, I'll do it in French from now. I guess that most readers of B.L.O.G. don't understand French. I apologize but… "C'est la vie" *smile*. Have a good wind, everyone. 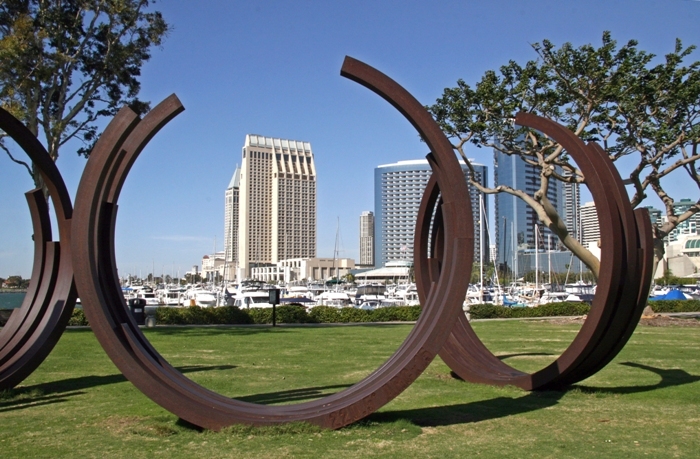 As reported in the previous blog, I saw again in San Diego those monumental sculptures by Bernar Venet I had seen in Bergen and Bordeaux. It reminded me of that short trip in Bordeaux two years ago for yet another medical conference. I don't remember much of the conference itself, but I do remember it was a good opportunity to try a couple of good wines. Yet the city was not pleasant at the time. A big part of it was spoiled by constructions for a new tramway. Visiting was a pain. On my last day there though, as I walked among the road works to kill time until the next train to Paris, I reached by chance the Jardin Public — The Public Garden — a heaven of peace and greenery downtown. 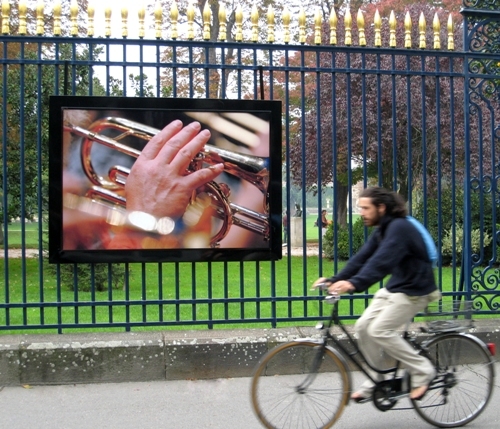 About twenty large photographs by Frédéric Desmesure were displayed on the fences of the park. 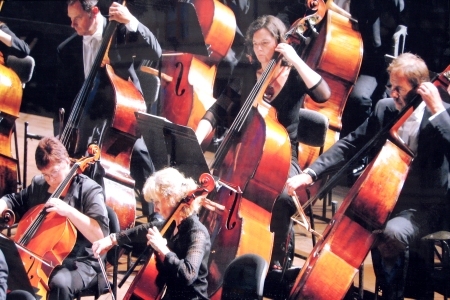 Taken during rehearsals, concerts, or in the wings, they caught various facets of life inside L'Orchestre d'Aquitaine, the Bordeaux Orchestra, freezing expressions, gazes, and gestures of the musicians, hereby emphasizing their work, stress, precision and concentration. Watching such a series of photos was a little like chasing rainbows: you try to see the music when you cannot hear it. Thanks to them, my mood was lighter when I reached the station. 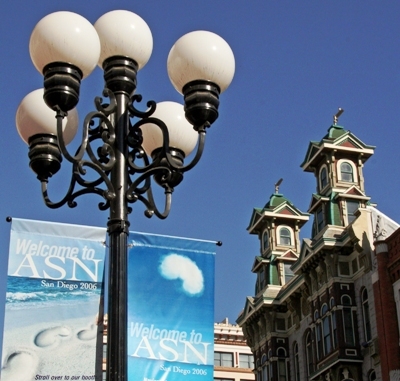 The annual conference of the ASN, the American Society of Nephrology, was held in San Diego two weeks ago. There was a lot of interesting stuff for a nephrologist there. No topic for this blog though. 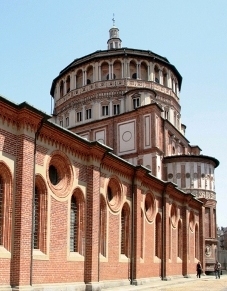 Rather than blogging about work, I will rather show photos taken while I strolled around in the city's streets and museums, either on the day before the Convention began this year, either during a previous stay in 2006, when another ASN Renal Week was held there. Architecture. 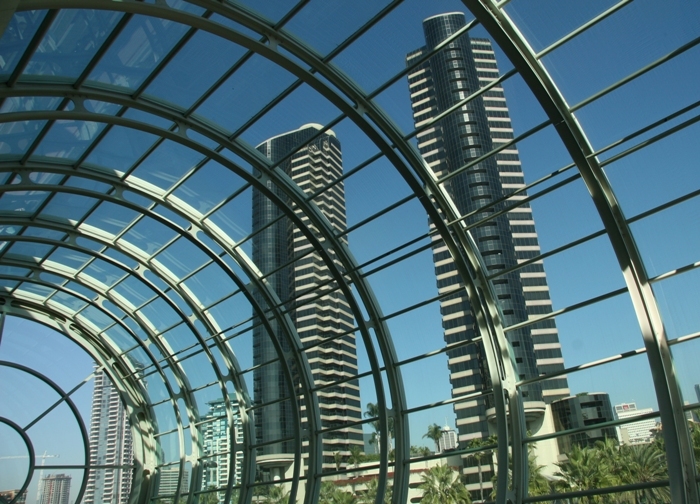 There are beautiful buildings in San Diego. In Gaslamp quarter especially, many houses are remarkable. The twin-towered building above is located at 837 Fifth Avenue. Its top floor used to be a house of prostitution and the first floor an Oyster Bar where Wyatt Earp operated for a time. 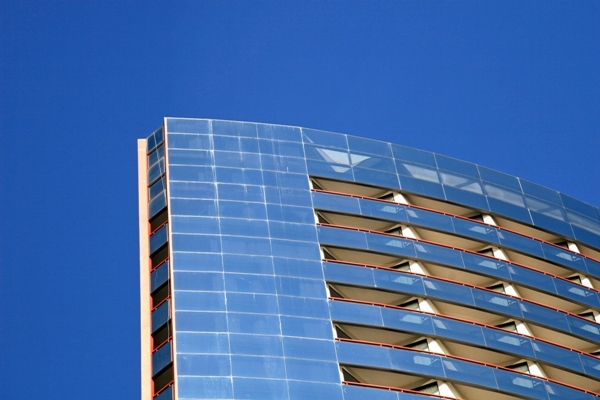 The Convention Centre itself is beautiful work, and many skyscrapers are beautiful as well. In Balboa Park on the contrary, buildings are essentially 20th century pitiful attempts to reproduce Spanish mostly, Tuscan sometimes, buildings of the baroque style... with stucco. The California Tower of the Museum of Man is nice though. Sculpture. 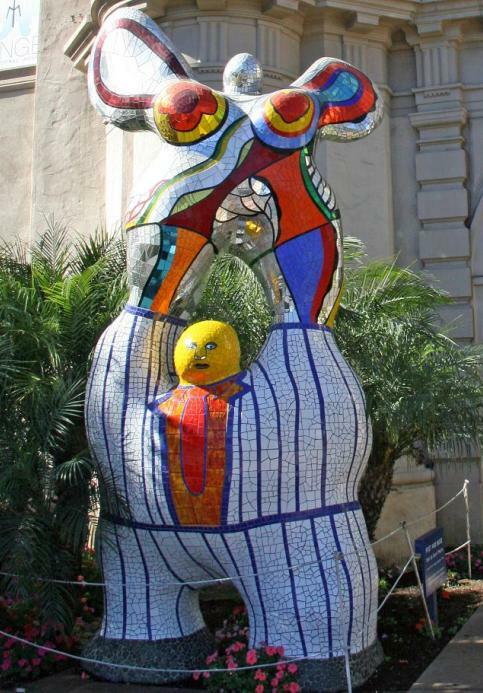 French sculptor Niki de Saint-Phalle lived in San Diego from 1994 to 2002. She had solvent-related emphysema, and enjoyed the paradise weather of the area. Yet it did not prevent her from dying of pulmonary failure. 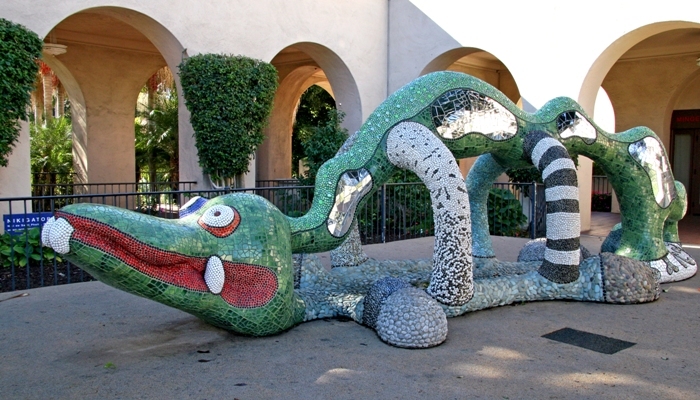 Two sculptures by her are exhibited in Balboa Park, in front of the Mingei International Museum: Poet/Muse and Nikigator. Children love the latter especially, some kind of dragon they are often brave enough to sit astride. 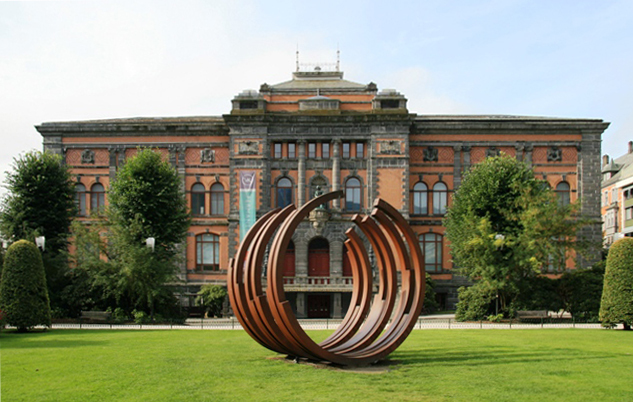 Another French Sculptor, Bernar Venet, was much in evidence in several places in the city, although temporarily only. You know what? I believe this guy is following me: everywhere I go, I see his iron arcs. When I had vacation in Norway in 2006, they were exhibited in Bergen. 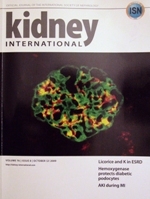 When I attended the annual conference of the French Society of Nephrology in Bordeaux two years ago, they were exhibited there. And at present they are exhibited in San Diego too! Sorry Bernar, but you'll have to resign yourself: I will never buy any, my kitchen is too small. Painting. 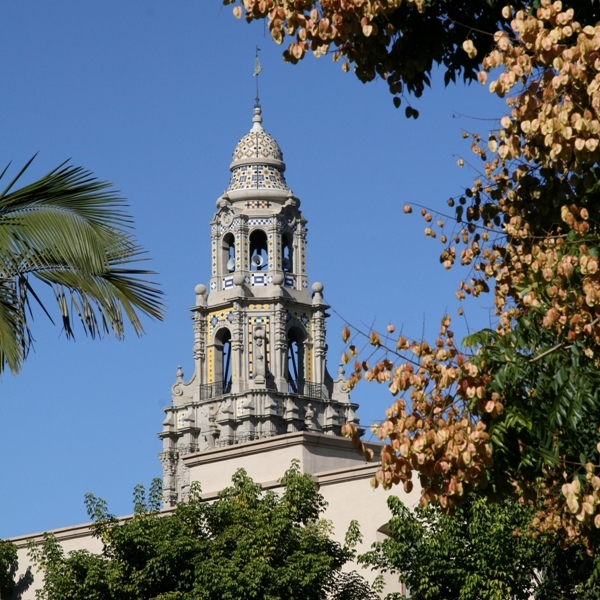 Close to the Mingei Museum in Balboa Park, the San Diego Museum of Art displayed artworks by Picasso and Miró especially, in a temporary exhibition. I liked a couple, essentially a drawing by Picasso of a Minotaur stroking a sleeping woman. There was an exhibition of Calder Jewelry too. I don't like Calder's mobiles that much. I didn't like his massive earrings, tiaras and necklace either. Anyway, the main reason why I went to Balboa park was the Museum of Art permanent exhibition, with several Renaissance paintings I had been longing for three years to see again. 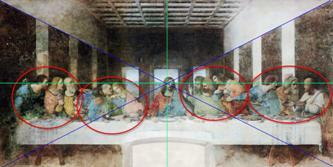 There are paintings by Rogier Van Der Weyden, Giotto, Titian, and others, Flemish and Italian. Here come a few words about my three favourite. 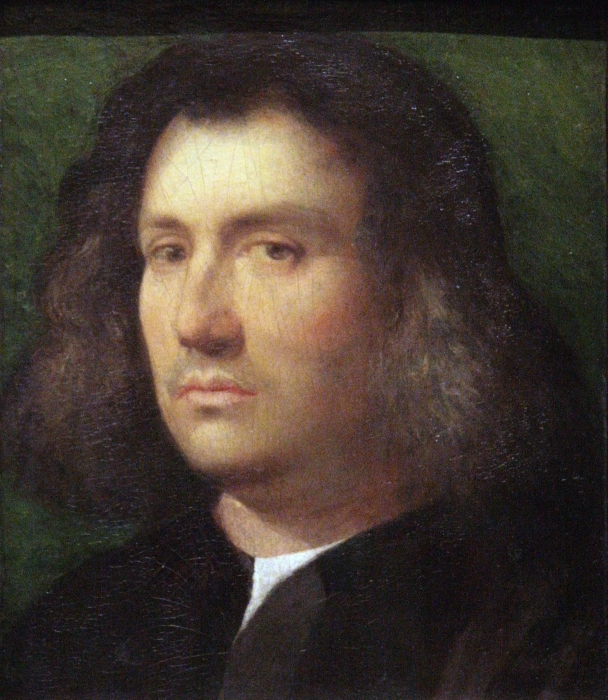 Portrait of a Man, by Giorgione. 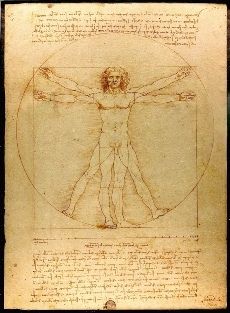 This painting is one of the greatest Renaissance portraits in my opinion. The composition is closely cropped around the head of the sitter. The setting or props often used at the time to animate portraits are absent, yet the man's turning gaze and ambiguous expression make the portrait wholly engaging and alive. Giorgione was friend of Titian (who finished his Sleeping Venus after his early death, a painting that foreshadowed my beloved Venus of Urbino — see a previous blog). He was unprecedented in his ability to describe warm flesh and soft hair. 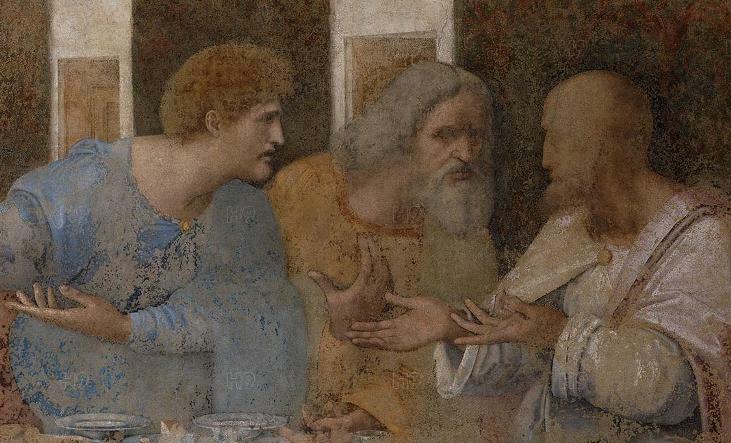 Quoting Georgio Vasari, Giorgione's 'modern manner' sought to paint 'living and natural things', several years before Titian, Tintoretto and Veronese arrived on the Italian scene. The Arrest of Christ, by H. Bosch. 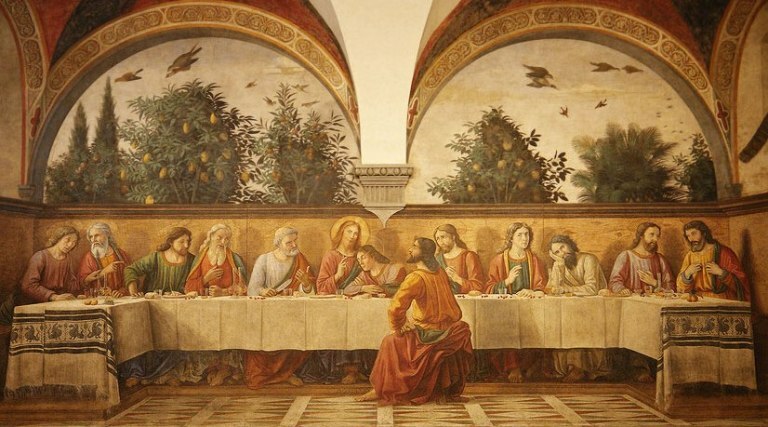 The painting depicts Jesus's arrest outside of Gethsemane. 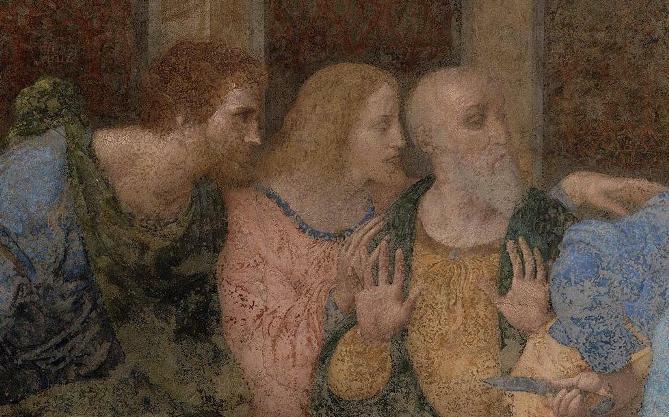 To the right, Peter raises a sword in defence of Jesus. 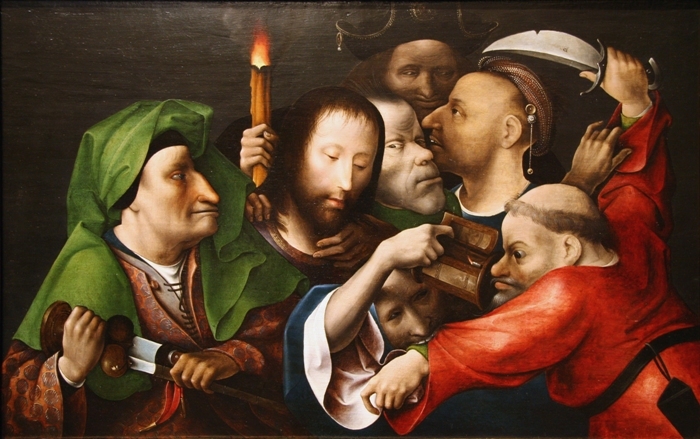 He has just cut the ear from the High Priest's servant, who bites his arm and thrusts a lantern in his face. The grotesque figures of his tormenters contrast with the serene image of Jesus himself. I love the way Bosch, in this painting, distorts the characters into something like caricature. 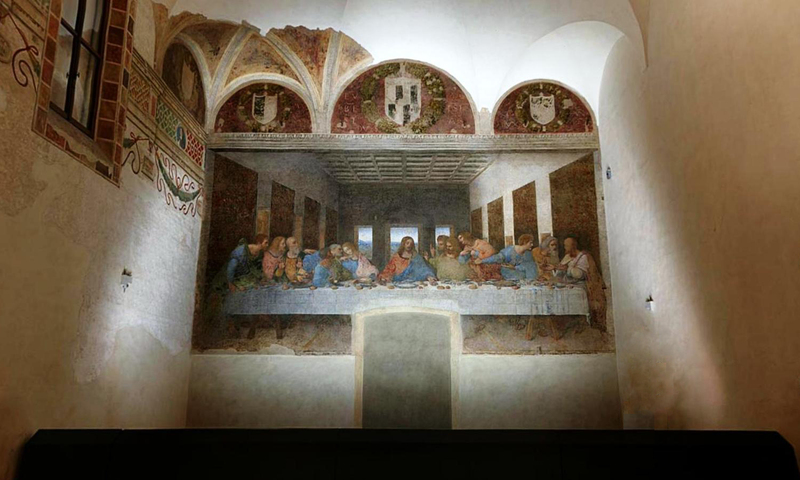 Can you believe this was painted 500 years ago? 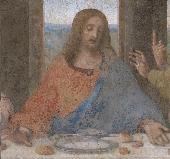 by Bernardino Luini. 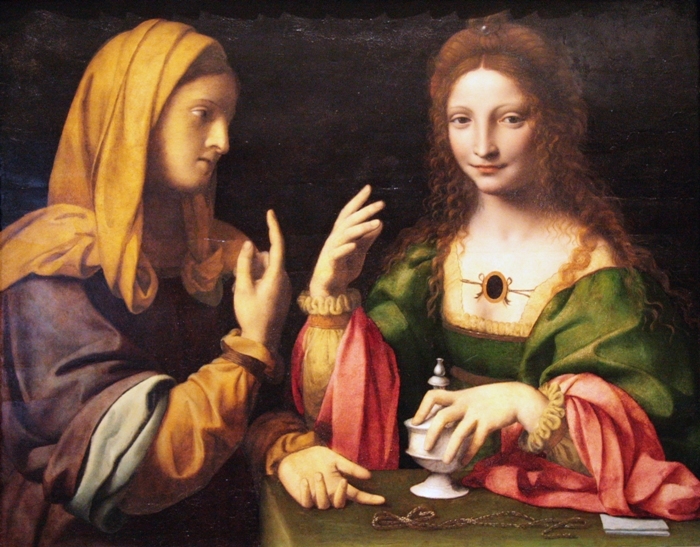 This is the moment when Mary Magdalene, the attractive and fashionable woman on the right, decides to put aside her finery (like the necklace on the table) and old life, and follow Jesus, like her sister Martha (on the left) previously. She holds an unguent jar, a symbol of her act of anointing Jesus's feet. 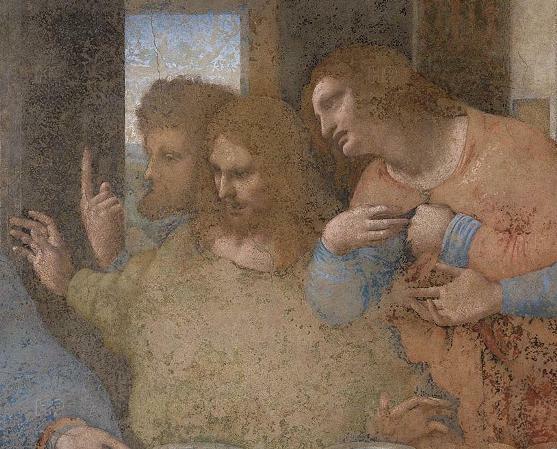 Bernardino Luini was among Leonardo da Vinci's closest followers in Milan. 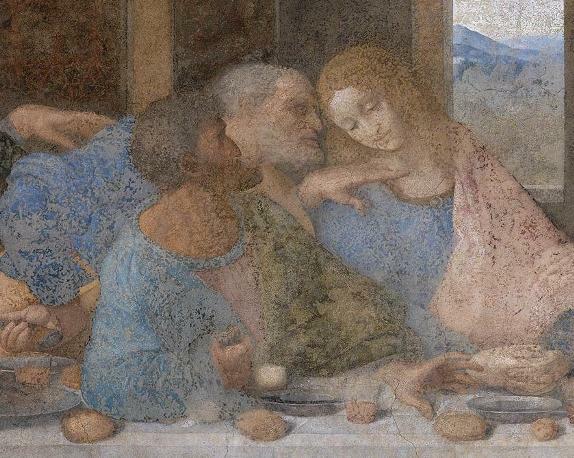 One can find a lot of Leonardo typical features in this painting: the characteristic figure types especially, with the mysterious, seductive smile of Magdalene, and the distinctive gesturing hands that animate the narrative. So... after one day in the streets and museums of the city, I had my eyes and camera full of pictures. It was just time to go to the Convention Centre and attend the Conference.